Atlantis has launched – possibily for the final time – at 14:20:07 EDT on Friday. The Mission Management Team (MMT) meeting on opened Friday’s relatively issue-free countdown by only taking 15 minutes to give a “GO” for tanking of Atlantis’ External Tank – a tank that became the focus of an investigation during manufacture. Initial findings point to a flawless ascent by Atlantis. A sign that Atlantis and her engineers want to mark what is potentially the last time she’ll be processed on the pad with a clean flow, can be seen via just the one IPR (Interim Problem Report) during the bulk of S0007 Launch Countdown operations. With the countdown starting on time, several holds are built-in to allow engineers to carry out troubleshooting, without risking a delay to the launch time. However, none of the contingency time has been required, mirroring the pad flow that still held the single day of contingency in the flow right up to S0007. “OV-104 / ET-136 / SRB BI-143 / RSRM 111 (Pad A): S0007 Launch Countdown call-to-stations was completed on time and countdown is proceeding per the timeline,” noted the NASA Test Director’s processing reports (L2) during S0007. “New IPR 0041: During Flight Crew equipment stowing ops, a tech inadvertently pulled coax cable apart at the GLMS (part of the lightning protection system) digitizer for MnA monitoring. The associated switch on the panel was taken to the “OFF” position as a safeguard and digitizer was powered down. The cable was then repaired, along with checks to ensure the system is operational, while the test team decided not to reinstall the GLMS due no lightning forecasted for the remainder of the countdown. SSV (Space Shuttle Vehicle) Pic Resistance test was then completed, followed by the PRSD (Power Reactant Storage and Distributation) load and OMBUU (Orbiter Mid Body Umbilical Unit) securing. With all issues cleared, and the MMT conducting a very short meeting – due to the lack of issues open for discussion – while out at the pad, SSME (Space Shuttle Main Engines) final preps and TSM (Tail Service Mast) securing was completed. Rotating Service Structure (RSS) retract to the park position began one minute ahead of the scheduled 1730 EDT on Thursday, followed by Ascent switch list and Final load preps. The MMT didn’t come across any constraints that wouldn’t allow for a “GO” to start LO2/LH2 tanking – which began on schedule at 0455 EDT, taking around three hours to complete. No issues were noted with tanking during the fill. Two new IPRs were noted in the Friday morning NTD report (L2), although one was closed and the other holds no impact in the countdown. A third IPR was noted, relating to a missing ballbearing that was found in the payload bay a few days ago, later – near the end of the countdown – believed to be from an onboard camera. This had to undergo a late discussion to clear ahead of launch. The next article will follow later today. During Thursday’s L-1 (Day) MMT presser, the NTD’s opening statements praised the large teams involved with preparing Atlantis and her hardware for launch. Those words were more than apt, considering an incident with STS-132’s ET-136 during processing at the Michoud Assembly Facility (MAF) in New Orleans. According to STS-132 Flight Readiness Review (FRR) presentations (50 FRR presentations available on L2) for the tank, ET-136 passed through a stage of its production process with four missing fasteners/bolts from its intertank ring frame. “ET-136 Missing Intertank Mechanical Fasteners: Assessment Item – Four (4) missing fasteners (0.25”, 26L10 blind huck bolt) not identified during planned inspections at Intertank mechanical final assembly on ET-136. 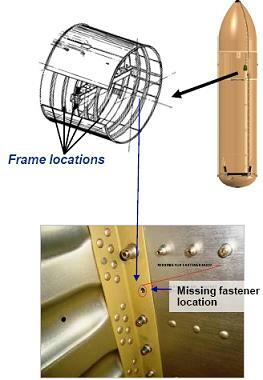 Fasteners common to all Intertank ring frames, 4 of 5 frames had one fastener missing,” noted the FRR presentation. The observation was only brought to light by an eagle-eyed engineer, who was working on a separate operation in the tank’s production, immediately calling over Quality Control (QC) personnel, leading to an investigation and rework. “Missing fasteners identified by technician performing harness installation in final assembly. Combined detailed shop/QC/DCMA inspection also performed in Bldg. 420 (visual and tactile),” added the presentation. 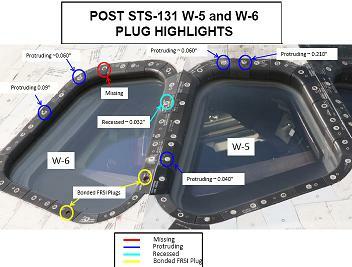 The presentation noted that the four missing fasteners were re-installed into the tank, along with inspections on the other tanks undergoing production (ET-137 – since shipped for STS-133. ET-138 – for STS-134 at MAF, and ET-122 – a completed tank undergoing foam reworks for STS-335, potentially STS-135). It is rare a production error occurs with the highly complex shuttle hardware, but the team’s ability to spot such issues for corrective action, and then list it in the FRR materials, shows both the failsafes and openness in the current SSP (Space Shuttle Program) culture. That FRR process also received praise from SSP manager John Shannon, who singled out the Kennedy Space Center (KSC) engineers who aided the completion of the ceramic plug inspections (another FRR item) – following observations of missing and loose plugs on a number of recent flights, around the orbiter’s windows, which have a small potential of becoming a debris hazard. “The (Agency) FRR last week went as well as it possibly could have. (Mr Shannon) was very proud of the team, working through the ceramic plug issue. The folks at KSC working at the pad, taking all the plugs out and getting all the data – that is not a comfortable environment,” he noted on the latest Shuttle Standup/Integration report (L2). Mr Shannon also noted that the SSP is – pending any slight remaining potential of an extension to the manifest – going out on a high, even if payload issues cause the manifest to slip into 2011.